Demand is growing for ABUKAI Expenses. We've teamed up with Verizon Wireless to make our product available in its VCAST Apps store. Now Android, Blackberry and Droid users can access ABUKAI Expenses more efficiently and eliminate the hassles associated with expense reporting. 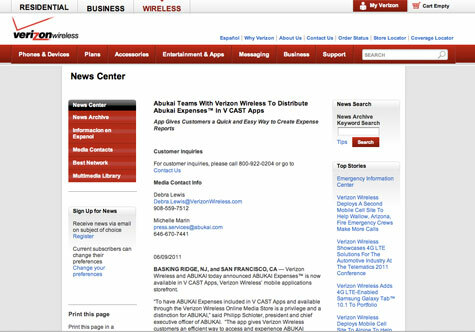 We're very excited to be expanding our product's availability through Verizon Wireless Online Media Store.